Bombala is a town in the Snowy Mountains region of New South Wales. Countrylink  has connections to Bombala from Canberra via Cooma three times a week. The V/Line Capital connection, which connects with the train from Melbourne at Bairnsdale and continues to Canberra runs through Bombala three times week. 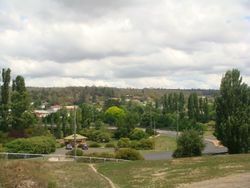 The Monaro highway passes straight through Bombala, connecting from Canberra and Cooma in the north, to the Princes Hwy in the south across the Victorian border. There is no public transport or taxi service in Bombala. The town of Bombala was settled in the 1840's, and was one of the major towns of the region. It was the terminus for the railway line from Sydney, which has now been progressively closed all the way back to Canberra. You can still see many historic buildings in the town. The railway station and lines are still there, and you can walk on the platform. The small down of Delegate is 30 minutes drive away. You can continue on the road south from there, for a 100km winding and scenic trip to join the Princes Highway. Great trip for those who love driving corners. Not so great for travelling with those with a propensity for car sickness. This page was last edited on 16 February 2012, at 12:58.